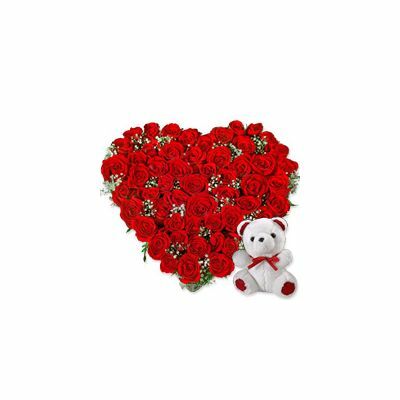 This lovely hamper consists of heart shape arrangement with 65 red roses and cute teddy bear10".Missing your loved one on special occasions? Do not worry, send our Missing U Combo and tell your beloved how much the person is thought of. Our Missing U Combo comprises of an exquisite heart shaped bouquet. 65 fresh red roses are arranged in a heart shape by our florist and fillers add to its beauty. 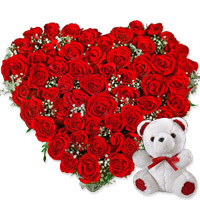 Send roses bouquet online and express your love through it. A cute snugly 10 inch teddy bear is also a part of this combo. The combo is an extremely thoughtful gift hamper and makes a lovely gift on anniversary, birthday and Valentine’s Day or when you want to say how much you miss your beloved. We have home delivery service and same day delivery service for your convenience.